We were really tired. We both love meeting all the awesome people we're meeting, we love the cycling, the seeing new stuff, we love the camping too, but after 8 weeks on the road we felt really beat and in need of a bit of down time, just the 2 of us and somewhere comfy to sleep so after a couple of hours route planning and researching Yellowstone and the Grand Tetons at Evanston library we checked into the Prairie Inn Motel. 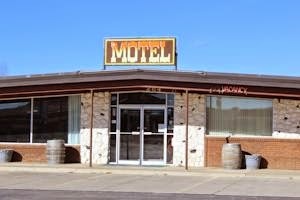 It's maybe the second cheapest motel in town, but with good reviews and it sounded quirky. We parked the bikes inside the giant room and took indulgently long hot showers before heading to the neighbouring diner. After some deliberation we both went for burgers and iced tea which we soon demolished. We asked about pudding and the lovely waitress gave us a run down of the options and her recommendations. We opted for chocolate silk pie and a 'scone'. Now if your British you're picturing a cream tea style affair, but you'd be wrong. This scone is a freshly deep-fried airy doughy creation sprinkled with cinnamon sugar which you then drizzle honey all over. Our hungers finally satiated we strolled back to our room to watch an episode of The Wire in bed before a long, comfy, blissful night's sleep. We hit the continental breakfast buffet early and got our money's worth before hitting the road refreshed, relaxed & ready to be sociable again. It's probably obvious to most of you, but the cycle touring really can be exhausting. Its not just the cycling, that gets easier on the whole as we get fitter. It's the other stuff that goes with life on the road. The living out of bags, the constant unpacking and packing. The fact that you think 'oh I'll put this in this bag, that makes sense and means I'll find it easier later' then completely forget 'the sense' you applied in stashing the waterproof socks with the tools and spend effort and time searching through the other seven bags before you check the tool bag, because why would waterproof socks be in there not the wet weather bag or either of the clothes bags? We do not have the packing and bag organisation down to a fine art. Most of the time it looks like a clothes explosion when we unpack and stuffing everything back in the stuff sacks & Ortliebs resembles a fight with an unruly jack-in-the-box. The meeting new people is hard too. Well actually the meeting part is really easy as Americans are incredibly friendly, inquisitive people. But the constantly retelling our tale; where we started, where we're heading, how long we plan to be away for, where we are from, what we did in our former lives, these things can get tiring, but we tell ourselves that while it may be the eightieth time we've answered these questions, it's the first time these people have asked and in return for all the hospitality, encouragement, kindness and generosity the least we can do is be as sincere and engaging as we can. To tell our stories from the road as entertainingly as possible and to listen intently to what they have to say. It does seem however that in the end all this can be pretty exhausting, so every now and then a lazy night in a motel, with only each other for company not only gives us a chance to spend time alone together, but to recharge our ability to cope with what the road throws at us, to embrace new encounters with enthusiasm and excitement and to better wrestle the unwieldy luggage back into its waterproof straight jacket.